Today the Ellis Island National Museum of Immigration opened The Peopling of America Center, a multifaceted collection that explores the entire panorama of the American immigration experience. The new center features major exhibitions that chronicle immigration to America before the processing station at Ellis Island opened in 1892 and after it closed in 1954. 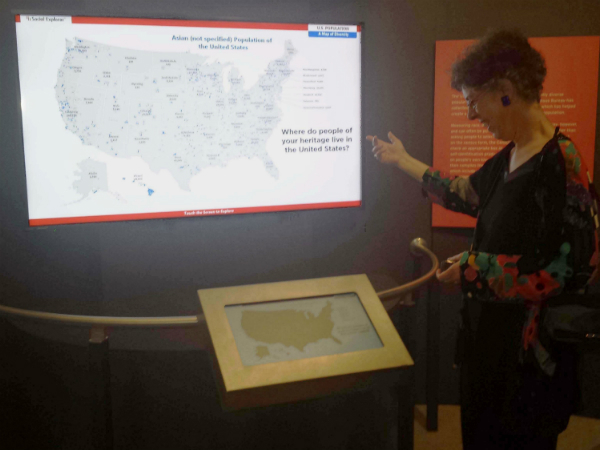 Social Explorer developed an interactive installation called U.S. Population: A Map of Diversity for the museum. 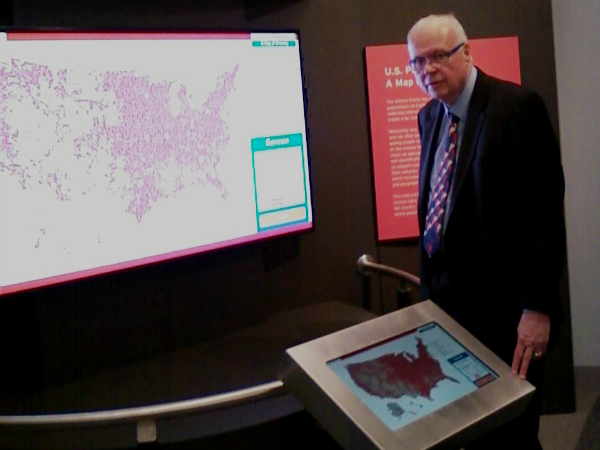 The kiosk-based exhibit invites the museum's 12 million annual visitors to learn where different ancestry groups live across the U.S.
Social Explorer's Andrew Beveridge at the U.S. Population: A Map of Diversity Exhibit. To create the exhibit, our team integrated data from the latest American Community Survey on over 130 different ancestries and origins from Afghan to Zimbabwean. We then created a comprehensive, easy-to-use interactive that displays these origins by tract and tabulates them for the state and national levels. Social Explorer's Fredrica Rudell tests out the maps. We are delighted to have collaborated with The Statue of Liberty Ellis Island Foundation, Inc./National Park Service on this project.